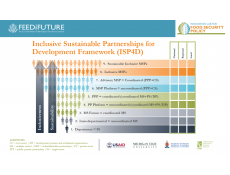 The University of Pretoria is part of the Feed the Future Innovation Lab for Food Security Policy (FSP) which consists of a consortium of three institutions including University of Pretoria, Michigan State University and the International Food Policy Research Institute (IFPRI). FSP seeks to support Feed the Future countries in addressing food insecurity and malnutrition and advance livelihood resilience for men and women by generating evidence for improved policies and policy processes. Our FSP research focus at University of Pretoria is geared towards supporting governments to make progress towards international, Africa and regional commitments such as the Malabo Declaration. We work in close collaboration with government, civil society and the private sector to ensure that our policy research is meaningful for their various areas of focus.